Portable power is a great thing to have when moving around a project site. It’s even better when you don’t have to unbind and re-wrap long cables just to set up your workstation. General Cable Retractable Powr-Reels are a portable power source, able to be plugged into most electrical outlets and run up to 25 feet. 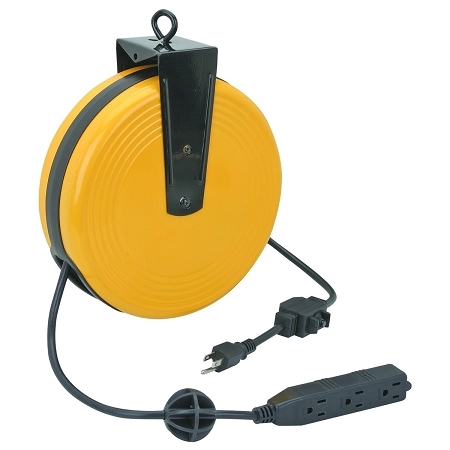 Designed to keep the extension cord off the floor to avoid tripping hazards, this retractable cable reel locks in place and starts retraction with a single pull. 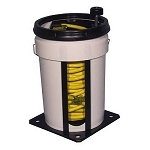 The General Cable Retractable Powr-Reel is built out of sturdy steel to take a beating and keep cords protected. Three grounded outlets are available to provide you with additional power around the industrial site, and the tangle-proof cord will keep them working for a long time, eliminating poor performance from cable damage. Approved by multiple organizations for safety and standards, the General Cable Retractable Powr-Reel is a quality product, rated at 300 volts for most electronic devices.